Courtesy of BEARZ Outdoor, this auction is for a Quick Dry Microfiber Towel & Beach Mat Set, the perfect compact travel solution. Set includes: 1 x Compact Pocket Beach Blanket (55″x 60″), 1 x Medium Quick Dry Microfiber Towel (48″x 24″), 1 x Small Quick Dry Microfiber Towel (15″x 12″) and is valued at approximately $53 USD / £42 GBP*. Auction Shipping: this item includes complimentary shipping within the USA only, all other destinations are excluded from this auction. BEARZ Outdoor is a small, growing family business that focuses on nature, traveling and the wonder that is the great outdoors! They believe there is something truly special about being surrounded by nature, and because of this they want to provide quality products that you can use and enjoy while you’re outdoor exploring. BEARZ Outdoor is designed for everyone, from solo travelers to adventurous couples and friends of nature to fun loving families, not forgetting your four legged pals too! So, whether you’re at the beach, camping, hiking, traveling, or simply enjoying a nice day at a park, be sure to bring BEARZ Outdoor gear with you. A multipurpose outdoor blanket, useful for outdoor adventures including: traveling, hiking, camping, backpacking, festivals, picnics, or just a lazy day at the beach or park! This blanket is durable, lightweight, compact, waterproof, sand proof and puncture resistant and folds up to fit right in the palm of your hand. This great 55″ x 60″ blanket has a clever design with corner pockets that you can fill with up with sand or stones to keep it weighted to the ground. The pocket loops at each corner are ideal for camping stakes too. It can fit 2 people comfortably and up to 4 for a picnic. Each blanket comes with a matching colored pouch and carabiners. Choose between: sky blue, apple green, cherry red, sunny yellow, cotton candy pink and digital camouflage. So, just hook it onto your backpack, throw it in your bag or keep it in your car, you never know when it’ll come in handy! A Quick Dry Microfiber Towel Set (2 towels), whether you take them to the beach, gym or on your travels, these microfiber clothes are incredibly handy. Ultra absorbent, antibacterial, fast drying and compact, these cleverly designed towels feature detachable hanging loops so you can simply clip, hang and leave them to dry, wherever you are. This set comes with a water resistant carry bag with clip, making them the ideal accessory for swimmers and campers. These towels are so popular they even hold the Amazon “Best Seller badge” in their category! Luxury Travel Diary terms and conditions apply. 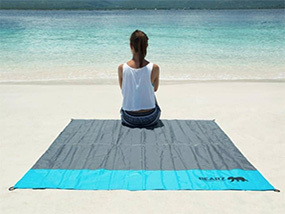 *This auction is for 1 x Compact Pocket Beach Blanket (55″x 60″), 1 x Medium Quick Dry Microfiber Towel (48″x 24″), 1 x Small Quick Dry Microfiber Towel (15″x 12″) all from BEARZ Outdoor valued at approximately $53 USD – please note this valuation is the list price provided to Luxury Travel Diary by the Auction Prize Provider and should be used as a guide only as cheaper discounted rates may be available. No cash alternative is available. This auction item includes complimentary shipping within the USA only, all other destinations are excluded from this auction. Prize will be posted directly to the winner from BEARZ Outdoor. Winners must pay for their auction item in full via PayPal within 48 hours of the auction end. The full Terms of our auctions can be found here. To the fullest extent permitted by law, Luxury Travel Diary will not be liable for any loss or damage arising out of the winners’ use or enjoyment of the prize; and the winner acknowledges that Luxury Travel Diary accepts no responsibility whether directly or indirectly for any claims whatsoever arising in respect of the prizes provided by third party providers or sponsors. Please note, if you win this auction you are not permitted to bid on another auction prize from the same provider within the same year, this is to ensure as many different bidders as possible get to experience this great brand.